MANUFACTURING 2000 (M2K) offers entry-level training to qualified applicants at no charge. The program supplies area manufacturers with employees to replace their aging workforce and strengthen Southwestern Pennsylvania’s economy. 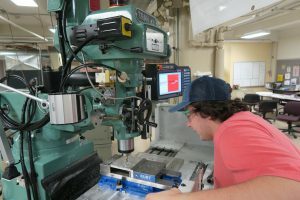 M2K, a program of New Century Careers, has been made possible through the efforts of area manufacturers, educators, foundations the Commonwealth of Pennsylvania, the US Department of Justice and the US Department of Labor. M2K is offered in Pittsburgh’s South Side and the Eastern Westmoreland Career and Technology Center in Latrobe. The program provides 3 levels of training over 250 to 600 hours. These sessions include hands-on experience, as well as special sessions focused on professional development and resume writing. Quick Train is the first 125 hours of M2K and is also offered as a stand-alone program in McKeesport. Quick Train may continue with additional training at the South Side location. Contact NCC for more information. New Century Careers administers enrollment for all sites (Pittsburgh, McKeesport and Eastern Westmoreland Career and Technology Center). Interested candidates may view the M2K application by clicking the link below. In addition, students learn blueprint reading, applied math theory, layout and benchwork. Students also attend various soft skill seminars as well as field trips to local Manufacturers. M2K’s ultimate goal is to place trained students in full-time positions with Southwestern Pennsylvania companies. Students will work with NCC Staff to prepare a resume and work on interview skills. The student will work closely with our staff to search for a job with one of our manufacturing partners. We work closely with each student to find appropriate employment. Since 1997, more than 160 Southwestern Pennsylvania manufacturers of all sizes have partnered with New Century Careers to find high-quality employees and improve their skills. NCC collaborates with many other agencies and associations to promote opportunities throughout the year that connects senior and middle management as well as frontline leaders with their peers and enable them to gain insights to emerging market and workforce trends. Being a partner company means understanding workforce development issues in the Pittsburgh region and committing to being a part of the effort to improve the quality of skilled workforce in Southwestern Pennsylvania. Companies that offer employment to New Century Careers graduates pay a small fee only if they hire an M2K trainee. This fee, however, is only a fraction of what the employer would have had to pay for training that individual. When possible, New Century Careers provides incentives that assist employers with OJT training subsidies. The program consists of both classroom and hands on experience as well as special sessions focused on professional development and resume writing. We offer both day and evening classes in Pittsburgh and evening classes in Latrobe. For more information about M2K training programs, call 1-800-822-9337 or contact us.